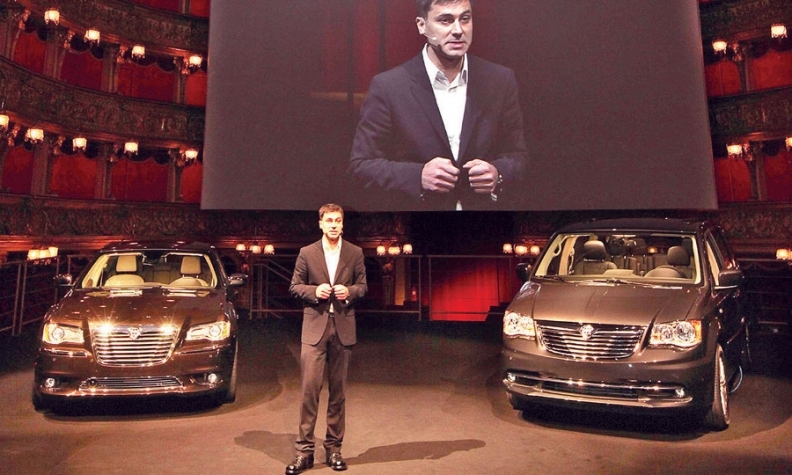 Saad Chehab introduces new Lancia models at the stunning Teatro Carignano in Turin, Italy. In June 2009, Ford executive Saad Chehab was invited by a friend working at Chrysler Group to meet Chrysler-Fiat CEO Sergio Marchionne to talk about Italian classic cars. His life hasn't been the same since. Marchionne engaged Chehab, an architect at Ford, in an hours-long discussion. "It ended up being a long conversation about everything -- design, brands, cars, ads, watches, life in general, aspirations, wishes, views and visions and so forth," says Chehab, now 44. "I was mesmerized and willingly seduced like everyone who has met him before." He left the meeting with a job offer to become head of brand communications for the Chrysler brand. He started a month later, in July 2009. His friends were shocked that he would leave Ford Motor Co. for Chrysler, which was in a critical state in the summer of 2009. "To be part of this rejuvenation, and part of writing history was really exciting for me," he says. Chehab's risky career move has paid off. He had a hand in the well received Super Bowl commercial starring rapper Eminem. And in September he was promoted to chief of the Chrysler and Lancia brands. Not bad for an executive who never worked in auto operations until he joined Chrysler. The hard part for Chehab is still ahead, though. Chrysler achieved a healthy sales bump this year with various product improvements. But top Japanese competitors were struggling with inventory shortages caused by the March earthquake. And the brand still needs distinctive styling. Lancia, to broaden its appeal across Europe, needs to rely less on Italy and on subcompacts. The brand is expanding its product range with larger vehicles from Chrysler. 1993: Senior design manager, Nudell Architects, Farmington Hills, Mich.
1999: Director, creative services, Ford Motor Co.
Saad Chehab, on meeting Sergio Marchionne: "I was mesmerized and willingly seduced like everyone who has met him before." At Ford, Chehab worked on global corporate architecture and on dealerships. Chehab says architecture and carmaking have much in common. They both require imagination to create visual forms, he says. And as he strives to build the brand image for Chrysler, visuals are extremely important. "It means that we have to start by telling the story of our brand in a visual way, a truthful description of who we are and what we do," he says. His greatest success on the topic was the "Born of Fire" commercial first broadcast in February during the Super Bowl -- an homage to the grit and spirit of Detroiters. 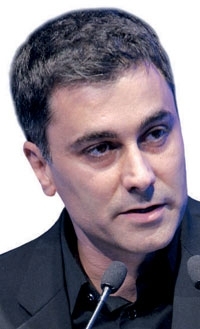 The commercial, on which he worked with then-Chrysler brand CEO Olivier Francois and with Marchionne, helped propel him to his current job, CEO of the Chrysler and Lancia brands. "Having spent most of my life living in Detroit and its suburbs made it even more humbling to be part of this love letter to Detroit," he says. "I went to school at 6 Mile Road and Livernois Avenue, and met my wife at the University of Detroit. We hung out at the clubs where Eminem performed and have witnessed the down times and the up times of Detroit. I also witnessed the Red Wings victories, and I saw the excitement of the city and how the people could come together in moments of rejuvenation." Chehab defines himself as a proud American with Lebanese roots. He was born in 1967 in Beirut, and comes from a family of self-made men. His father and grandfather started a food processing and canning factory, packaging pasta, sauces and other foods. The family later added construction and real-estate development. This was why he was sent to Detroit to study architecture in 1986, at age 19. In 1988, he met his wife in college, and the couple married in 1993. The couple lives in suburban Detroit with their three children and a dozen classic cars, ranging from American muscle cars to European classics including Alfa Romeo and Lancia. But no Ferraris -- yet. Gasoline has been in Chehab's veins since he was a kid. He was the family car washer, spending his weekends cleaning family and company cars. He even washed cars owned by his uncles and aunts. His father (without telling his mother) taught Chehab to drive when he was 11, on a rear-wheel-drive Fiat 238 van with a manual transmission. "I was so young that I had to drive almost standing up," he says. Chehab notes that Marchionne pushes people to find abilities that they did not know they had. He considers himself living proof of the potential of Marchionne's unorthodox management style. Marchionne gives managers creative freedom to excel. But he also expects top managers to work grueling hours, travel extensively and accept micromanagement if Marchionne takes an interest in their projects. As CEO of the Chrysler and Lancia brands, Chehab has some authority over product and styling decisions. But the final word is always by Marchionne, as it is for any brand in the Fiat-Chrysler group. Chehab, as he plots the comebacks for the two brands, is splitting his time evenly between Auburn Hills and Turin. "Right now we are expanding the Lancia brand outside Italy and assessing and responding to the latest market challenges, requirements, trends and what the brand perceptions are in Europe," he says. He would like to develop new vehicles that could be rebadged, with minor modifications, for both Chrysler and Lancia. For example, Lancia is rebadging for continental Europe the Chrysler 300 large sedan and the Chrysler Town & Country minivan. But neither product was designed at the outset for both brands. The challenge is to find the proper designs that strike a chord for the brands on each side of the ocean. But Chehab's longtime quest for good visuals, first in buildings, now in cars and commercials, will no doubt help.